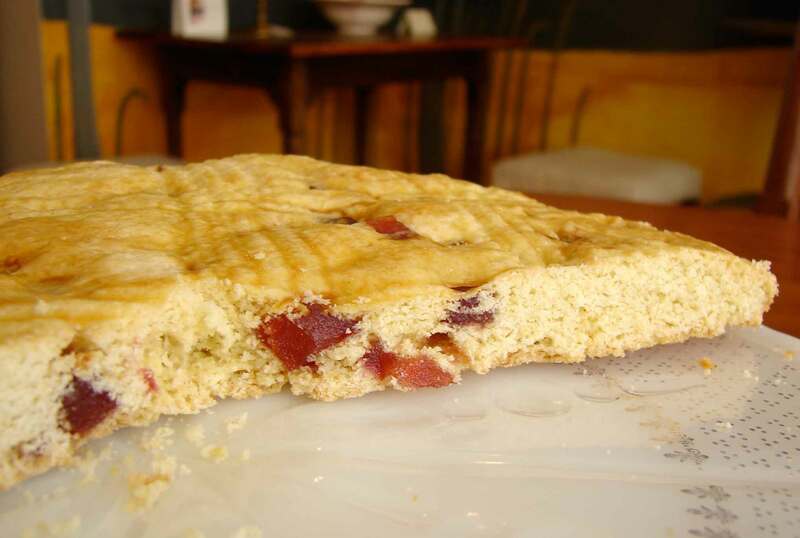 This Galette Bretonne is a lovely cake. It’s a little like a giant shortbread cookie, a bit crunchy on the outside and soft within. It calls for “fruits confits,” and since I’m not a big fan of most candied fruit, I decided to use small pieces of quince membrillo that I made at Christmas time. You could use any kind of dried or candied fruit you like. I think candied ginger would be nice, too! Or you could leave the fruit out altogether! Here’s Space Boy Dream, by Belle and Sebastian, which is a nice expression of a flight of fancy. Put the flour into a large bowl. Grate in the butter, and mix with your hands to form a coarse, crumbly texture. Add the sugar and baking powder, the membrillo and the eggs minus 1 tablespoonful, which you’ll reserve to coat the top. Mix everything well with your hands. Knead for a few minutes to make sure everything is well incorporated. You should have a sort of soft sticky dough. I baked mine in a springform pan, but you could also just bake it on a cookie sheet. Either way, lightly butter the surface of your baking vessel. On a very well-floured board with a well-floured rolling pin, roll out the dough to be about 1/2 inch thick and about 9 inches in diameter. Place it on your baking tray or in your pan. 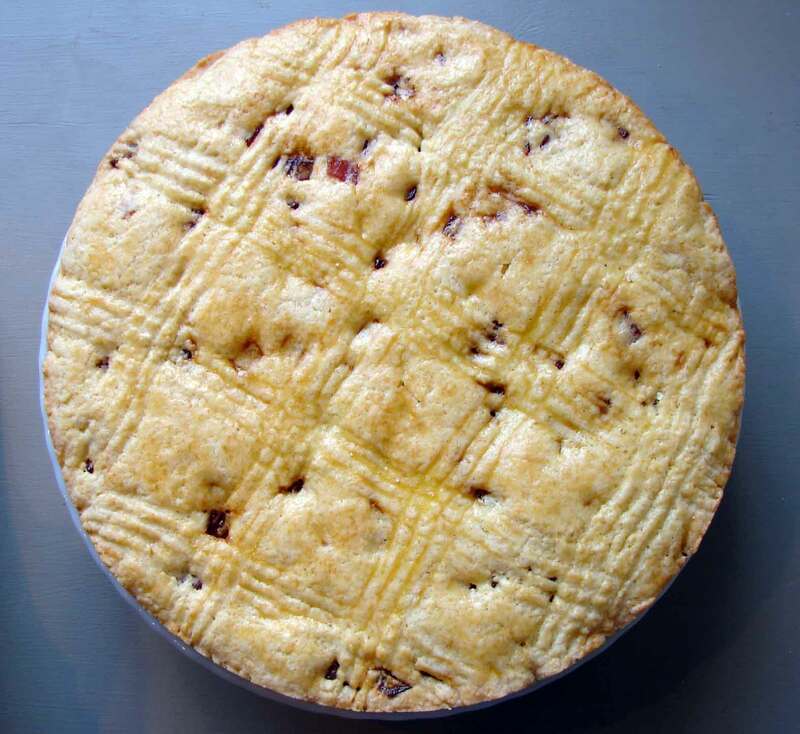 Using a fork with sharp tines, make a sort of plaid criss-cross pattern in the top. Brush the top all over with an even layer of egg. Bake until firm and golden, about 40 minutes. Allow to cool, then remove from the pan, slice, and serve. This entry was posted in cake, recipe and tagged french cake a week, galette breton, shortbread cake, simple cake by Claire. Bookmark the permalink.